At $2,700, Is This Good Ol' 1983 BMW 320i Good Enough? 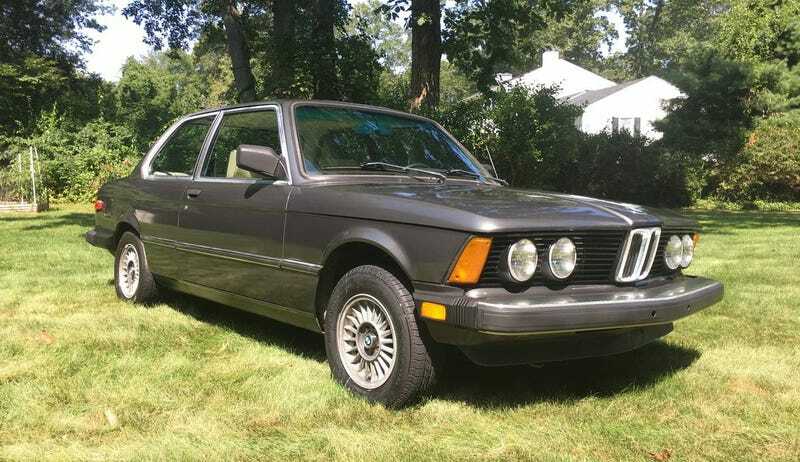 Today’s Nice Price or Crack Pipe Bimmer E21 currently calls America’s smallest state, Rhode Island its home. Let’s see if its price will make it kind of a big deal everywhere. The cool thing about being in the military is that they pay you to play with toys that are typically denied to the civilian population save for the weirdos that haunt musty smelling army surplus stores. Every once in a while the rest of us get a chance to go Army and just such an opportunity was represented by yesterday’s 1967 Kaiser Jeep M715 flatbed truck. It looked OG-107 as heck, and seemed to have a enough life left in it to take up a new career in the civilian sector. Its $8,495 price tag also made a lot of you consider joining up, and by Taps it had collected a respectable 58-percent Nice Price win. Let’s say however, that the military isn’t your bag. Instead, you’re more interested in polo shirts with popped collars and lunch at the “Club.” What might you potentially drive if you so fit this description? Yeah, I’m thinking a BMW is very likely in the cards. Other German brands may also suffice, but the standard bearer of the modestly monied is Bavaria’s finest. Today’s 1983 BMW 320i represents what the younger set of that class might have driven back in its day. This one rocks a five-speed stick, so it’s a little more for the masses, but it still looks aspirational to this day. The E21 was the first ever model in the now iconic 3-series line. Available exclusively as in two-door three-box body style from the factory, the model replaced the “Neue Klasse” series which had been in market since the early sixties. Here in America, the E21 was available exclusively with four-cylinder power. This being an ’83, its model number no longer reflects its displacement as starting with the 1980 model year BMW had replaced the 2-litre M10 with a 1.8-litre edition. That put out 99 horsepower, which gave the car zero to sixty times of just under ten seconds and a top speed of about 110 miles per hour. Yes, those are yawn-inducing stats, but here at least the five-speed will ensure even those are modestly entertaining. The car comes with a substantial 203K on the clock, and it’s actually quite amazing that clock—meaning the odo—is still barrel rolling along at that number of miles. The “Graphit Metallic” over beige car looks to be in amazing shape for its age and those miles. There are some flaws in the paint, and the foil rear window trim has turned its sickly shade of orange as they do, but otherwise it’s all pretty clean and intact. Inside, there’s a torn driver’s seat with which to contend, and the seller notes some cracks in the dash. Those don’t seem to show up as noticeable in the pics so they’re probably something you could live with. The rest of the interior is tidy enough although demonstrative of its age. The carpet is faded where the floor mats didn’t cover and there’s a modern stereo pointing skyward beneath the unnecessarily cryptic climate controls. We don’t get to see the four under the hood, but the ad claims the car to be “mechanically sound” and a “turn key daily driver.” The sunroof is said to work, which is a plus, however there’s apparently a hole in the muffler, which isn’t. Over all this looks to be one amazingly clean example of the earliest 3, and one that might make a new owner a very happy polo wearing club-goer. That is, if its $2,700 price tag doesn’t disenchant. What do you think, is this old 320i worth that kind of cash even if by today’s standards it’s not really the “Ultimate Driving Machine? Or, is that price just not good enough?